Part of the Simpson’s DNA is the commonality we all share with cycling, regardless of what make of bike we ride, what kit we wear, or how old we are - we are all cyclists. We formed ‘Simpson CC’ to bring riders and readers together to experience new roads. We all have our favourite routes and locations so why not come together and share them with others? 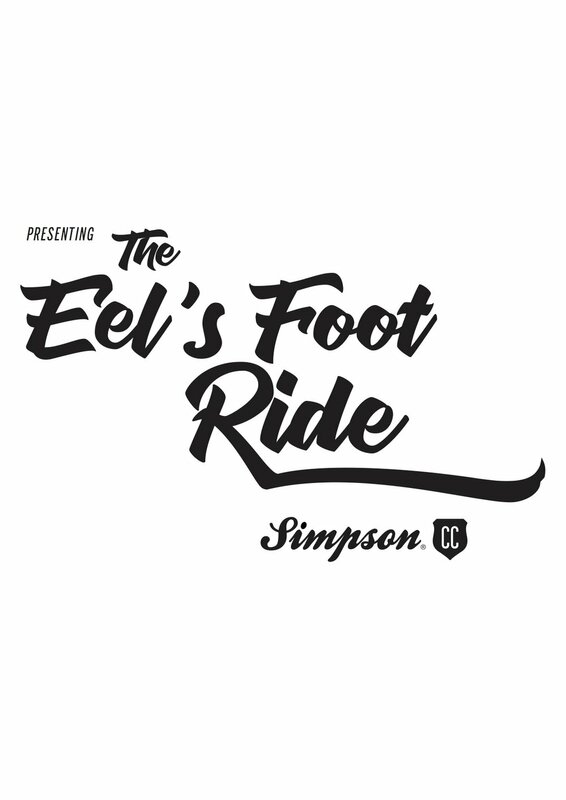 Nestling between the two Grand Tours, Simpson CC’s Eel’s Foot Ride set out to bring a group of riders together on a road trip odyssey. After the success of our first club ride - London to Brighton, it was time to get social again. Suffolk has always been (and always will be) key to our riding enjoyment. With it's endless skies, the sea, cold war airbases, Viking burial grounds, UFO sightings - it has a complete palette to captivate the mind, heart and legs of any rider. We wanted to indulge a group of riders on what could be seen as a legalised ‘acid drop’ experience via two wheels. For many years the mystique of the Eel’s Foot Inn had fascinated us, a 16th century pub in the almost lost village of Eastbridge, Suffolk. It never really felt like it existed. No-one we knew had ever been there. An arrowed sign pointing down a narrow leafy lane had always been a mystery to us. Even the name is an unnatural coupling of objects resonating the unique eccentricities native to this region. Every ride needs a gathering point, a place to meet and chat. The best ones serve coffee, tea and a bacon roll. For us every ride feels like it begins at 'Doctor Watson’s Lane' - it’s as if you flick a switch marked countryside and boom, you’re there. Geographically the nearest food venue is the Kesgrave Kitchen, (affectionately know by locals as just ‘The Cafe’) - a landmark roadside pitstop of some 40 years standing. Owner Paul Driver is a quiet humble man with an eccentric ring tone that he has to listen to in full before answering, liked the whole ride idea and volunteered to open the venue especially for us. Chapeau to the man! We had our starting point, a beginning - hell, this thing was going to happen! The response to the newsletter announcing the ride was like waiting for RSVP’s to a birthday party to be returned. With restricted numbers to keep things manageable places went fast with a few additional extras added for the inevitable last minute fall out factor. Like baking a cake, it’s the key ingredients which make things special. In this case the rider mix was spot on. An eclectic combination of readers, die hards (those as close as family to the magazine since the beginning) and even a semi pro had signed up. 19/08/20 6:25am: we receive an email, ‘I’ve broken down on the M25 and it’s looking likely that I’m not going to make the ride’ and so it began. Another rider had driven across from Somerset the night before, missed his alarm call, forgot his Garmin and only awoke after dreaming about 90’s newscaster Selina Scott. He made it just in time after a manic cross country dash. One by one riders amassed at The Cafe - the buzz of the ride had begun. Fuelled on bacon and egg on granary, 'Buster' baps and Espresso shots the vibe was good. To cut down on any pre-ride awkwardness between riders, we briefly introduced everyone in a manner reminiscent of a 70's style stadium Rock Band intro. With everyone settled it was time to grab bikes, clip in and begin the ride. The route had to reflect the qualities and type of experience we wanted to impart on its participants. Main roads were kept to a minimum. A circular route worked best to reunite riders with their vehicles and 70 miles appeared as the optimum distance for a ride of this nature. Although billed as a ‘social’ paced ride we knew there would be moments when a competitive element would surface - after all no-one was going to turn up on a bike with a basket on its handlebars. To accommodate for this inevitability we threw in a four stage King of the Mountain challenge to pacify any build up of testosterone. Situated just past the landmark of Snape Maltings concert hall, stage two paid homage to the 2012 Tour of Britain KoM section. It was a slope really, (think Suffolk not the Pyrenees), but it did see several riders kick it up a gear and gun it to get those all essential points. The pace was steady and the chat good. Everyone worked well together and with a zero puncture count, the Eel's Foot Inn, our halfway point/lunch venue was reached as effortlessly as the Adnams 'Freewheel' brew it served was consumed. All along the weather had been kind to us, overcast but pleasantly warm - a better combination than wet and humid. It meant taking advantage of dining alfresco, sampling the sensory delights of the wood-fired pizza oven. A combination of fine food and drink was almost the undoing of at least 50% of those on the ride, a lot of re-motivation was required to shoehorn bums back on saddles. The homeward leg separated the regular riders from those used to more extreme mileage but everyone waited for each other. The camaraderie was strong. The final KoM stage saw the ride light up one last time - first up was Matt who also took the overall prize. Amid the post ride euphoria, talk turned to another outing but where next for Simpson CC. Rest assured a few plans are already formulating. Paul, Clive, Ian, Dom, Andy, Kieran, James, Rob, Matt and Ollie you were taken deep into the unknown - we salute you all. We would like to thank OTE for supporting the event with energy bars, tabs and gels. Clive Tricker for his route mapping skills, Paul Rippon for leading the ride, photographer Matt Grayson for working like a trouper all day and capturing the unique essence of the ride, Amy and the staff at The Eel’s Foot Inn for hosting a great venue and once again to Paul Driver at the Kesgrave Kitchen for fuelling empty bellies. You all made the experience a very unique one.